The passive-aggressive (and a lot of times not so passive-aggressive) hating that takes place whenever talk turns to the Los Angeles Lakers, Miami Heat, Boston Celtics and New York Knicks is so common, it’s almost indistinguishable from regular NBA commentary these days. Despite the fact that two of these four franchises have won a grand total of two championships since 1973, this specific fantastic foursome is constantly lumped together and, more often than not, scorned for some reason or other. And that’s fine. The Lakers, Heat, Celtics and Knicks obviously enjoy certain benefits because of where they’re located that other small market teams don’t get to enjoy. Even if Dan Gilbert wasn’t the horrendously incompetent and pathetically lame owner that he is, getting superstars to go to and stay in Cleveland when sunny Miami is calling is undeniably tough. Even if Orlando Magic CEOs didn’t drunk dial their superstars, getting a big man to brush off the allure of Hollywood or New York when free agency rolls around is no easy feat. But let’s also be fair. Ever since the Chris Paul-to-Los Angeles deal came crashing down on Thursday night, there has been near universal agreement that his highness David Stern made an awful decision. Fans typically divided in allegiance came together to renounce the pure and indisputable idiocy that went into rejecting that initial three-team deal between the Lakers, New Orleans Hornets and Houston Rockets, and they did it because blatant BS crosses party lines. There was no gray area here – the league was wrong. Throw out the fringe Devil’s Advocates who like to argue for the sake of arguing, and the nearly unanimous opinion coming from hoops fans was that what happened was an out-of-bounds move by the league and should not have happened. People didn’t get wound up and angry because the Lakers got screwed by what transpired, they got mad because of what transpired. Period. On Saturday night word leaked that the Lakers had backed out of negotiations with the Hornets and Rockets for a deal that would have gotten them Paul after the league rejected a restructured proposal submitted that same day. As if on cue, talk quickly veered away from how the league really messed things up for the Rockets and Hornets to how the Lakers messed things up for the Rockets and Hornets. By pulling out of negotiations after a second rejection in order to pursue Dwight Howard, the Lakers were apparently doing something wrong. Because they had come this far, if you go by certain people’s opinions, they should have forgone the shot at getting Howard because of the uncomfortable predicament New Orleans and Houston now find themselves in. What kind of warped logic is that? Let’s be clear on this: the Lakers wanted to deal for Paul. They, in good faith, put together two official proposals -- and God knows how many unofficial ones -- to nab one of the league’s top point guards. This deal was supposed to be done by Friday, thereby leaving L.A. ample time to chase their number one target: Howard. But then the deal collapsed. And when the deal collapsed, it forced the Lakers to have to dedicate more time to appeasing the unappeasable divas that own the Hornets, and turn their attention away from the guy the New Jersey Nets were (allegedly) tampering with. From the very beginning it was made clear that the Lakers valued Howard above any and all other potential acquisitions. It’s only good sense that they would drop everything to chase him. So, no, contrary to what some commentators are trying to insinuate, this wasn’t a case of the Lakers doing anything wrong. They didn’t drop out of the race for Paul by choice, they did it because the league repeatedly dropped the ball on the matter. It’s unfortunate for all parties involved – Rockets, Hornets and Lakers. On Sunday, news broke that because reverberations from the failed Paul deal were still being felt throughout the league, the Celtics weren’t able to close the deal on acquiring David West. Add that to the fallout from Stern’s reluctance to act like a leader when the situation called for it. Rather than try to turn L.A. into the villains here, let’s continue to call a spade a spade: Stern mucked this up. He mucked it up on Thursday night by vetoing the initial deal. He mucked it up Friday morning by doubling down on his ridiculous decision with a bunch of rambling lies. He mucked it up Saturday night by rejecting the second proposal. And, most importantly, he mucked the chance to improve four franchises (Lakers, Hornets, Rockets, Celtics) in his league, just so that he could pander to a select group of whiny, incompetent owners. Heading into the new week, the Lakers, Rockets, Hornets and Celtics are all worse off than they were heading into last week, and it’s important to dish out the blame for that where it’s actually due, not where you wish it was due. 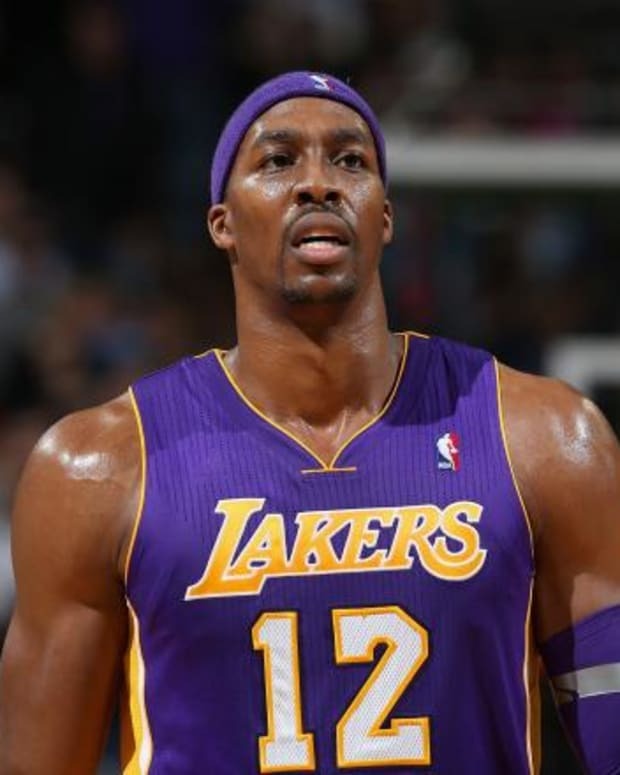 NBA Rumors: Dwight Howard to Leave Lakers for Hawks, Mavericks or Rockets?